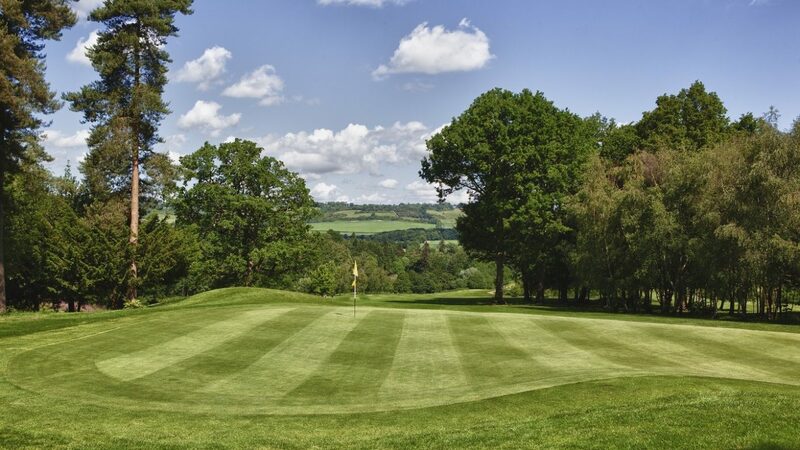 Boasting established forestry, lakes and stunning views over the Kent North Downs, Westerham Golf Club is a 6,300 yard par 72 course and a picturesque golfing challenge you will not quickly forget. Fairways lined with pine trees, colourful rhododendrons, strategically placed bunkers and three beautiful water features make Westerham a solid test for any standard of golfer. Built to a high standard with USGA specification greens and full irrigation throughout, Westerham is playable all year round. With a number of memorable holes, such as the par 3 ‘eye of the storm’ 11th with daunting pine trees and bunkers protecting a small green, a round at Westerham will stay in your memory, as will the closing hole, which requires lake & bunker clearance to play out in a grandstand finish in front of the clubhouse! Exceptional first class practice facilities including an indoor golf simulator, short game practice area, 10 acre driving range and its latest development, ‘The Churchill 9’ – a new 9 hole golf course, sets Westerham apart from the rest. Off the course, a warm welcome awaits you in Westerham’s contemporary clubhouse, which offers first class facilities for dining and entertaining and panoramic views across the lakes & fountains to the course beyond. Whether you choose one of our pre-set packages or opt for a tailored day, our experienced team will work with you to ensure your visit is an enjoyable one. Westerham Golf Club is located on the A25 just outside the village of Westerham, just minutes from the M25, A21 & M26 motorways. Approximately 40 mins from London, the nearest train stations are Oxted and Sevenoaks, both of which have taxi ranks (10-15 mins by car). We welcome visitors 7 days a week.